After 4 months away, I am finally back home. The house is still intact and only a few jobs to do while I acclimitiese to living at sea level again. I finished on a high in the Alps, I passed my exams for the ski test, so when I say the 'end is nigh', I mean for me completing the Guide's scheme, not the end of the world! 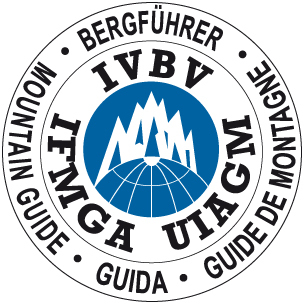 In 4 months time, I will carry out my final test, which will be in the Alps and then I am done! Wish me luck! In the meantime I will be back home for a wee while. Looks like a busy spring coming up with several requests to do one day Cuillin Ridge traverses so I'm hoping the weather plays ball and we have a successful season. The last part of my Alpine ski season was mostly spent hut to hut touring with various different guides. We generally had nice weather but some plans weren't carried out due to the constant changes we were experiencing. It wasn't until my final week (The Test!) where the weather was settled and we could enjoy the summits and cols. It was a total relief to 'finally' get the word 'pass' and I could come home knowing I had learnt enough to pass what I thought would be the hardest test for me. I came away pretty inspired about ski guiding. It is something relatively new to me and I'm looking forward to spending more time guiding folk either freeriding or ski touring. So...lets see how the climbing has been affected by taking 4 months off...!